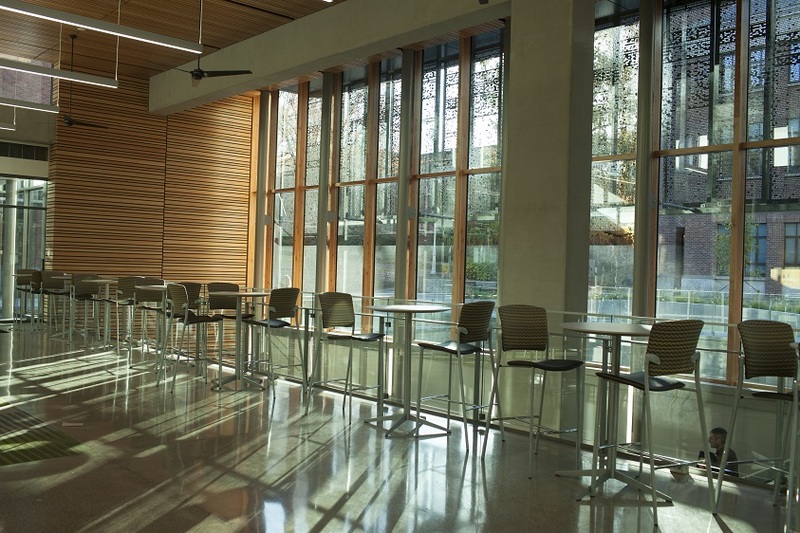 The Elements CaFe is on the ground level of the Price Science Commons, as is the area referred to as the "social commons," a term we developed to indicate how the space is different from the "academic commons" below. You're welcome to use any of our spaces for group work and discussion (except the quiet area and stacks, for reasons that are probably self-evident), and you can be academic anywhere you want. 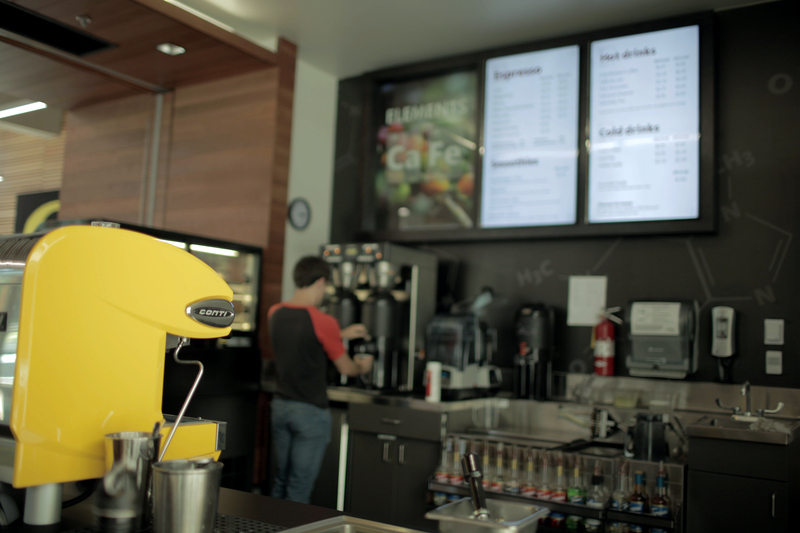 Elements is open weekdays during academic terms, and serves a variety of coffee and snacks. Feedback about the hours, food selection, or staffing in Elements is best directed to UO Housing, which oversees satellite cafe units around campus. The social commons consists of seating adjacent to the cafe, and also along the edge of and at the head of the stairs. Groups who would like to use the AV equipment to host a talk or event in the social commons can expect that Elements will remain open and that tables will remain available for general use throughout; this makes the space ideal for "Science Pub" talks or lightning talks by groups of individuals who would like to share their research or work. Questions about use of the space can be directed to the manager. Most weekdays between 10 and 3 the social commons is fairly active. The space that isn't full of tables is hallway. It is important we not set up events which would block access to any of our spaces, and it's required that we not create a scenario where egress in the event of fire is compromised. Rearrange soft furniture at the north end so you can put a table behind the slinky seismometer well back from the top of the steps and such that the rearranged items are usable and not disruptive. Put a table close to (but not right up against) the edge of the carpet so you're looking at everyone going past on the concrete walkway a couple of feet away. Set up near the foot of the stairs, between the platform that forms the turnaround in stair direction and the wood wall to the south. That's not actually in the social commons, of course, but might meet your goals. Because Elements is in the business of food sales, it's generally preferred that tables and events in the space not compete with that very much. So, if your event is giving away snacks, we encourage little things like individual mandarin oranges or fun-size candies. We're always going to want to approve any event going on up there (contact the manager), and to set a specific start and stop time and date so your and our expectations about scope and duration comport. Whatever you need to rearrange to make your space, you need to put back, the way it was. If you get to the end of your time and people have started using tables and chairs you didn't put back, you'll need to let us know by clearly telling us what isn't put back, and by conveying that to permanent staff if possible since desk staff rotate a lot.